A spectre is haunting Europe with the growth of far-right, racist, populist and openly fascist organisations. Far-right electoral breakthroughs in Hungary, Poland, Austria and Germany show the dangers of fascism and racism going unchallenged. 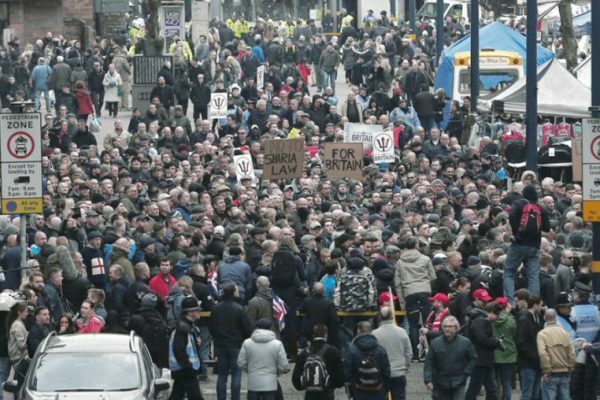 In Britain we have the Football Lads Alliance (FLA) and its offshoot the Democratic Football Lads Alliance (DFLA) who were able to put 40,000 people on the streets for a march in London. In Birmingham 2,000 marched, outnumbering counter-demonstrators. We are fighting back, but more needs to be done. Friday is the 50th anniversary of the speech by racist Tory MP Enoch Powell in Birmingham where he predicted “rivers of blood” in the multi-racial West Midlands. It is perhaps poetic justice that Powell’s old constituency, Wolverhampton South-West, is now represented by a black Labour MP Eleanor Smith. On Friday, Midlands region of the Trades Union Congress, together with Stand Up To Racism (SUTR), will take over the room in a Birmingham hotel where Powell delivered his infamous speech in a powerful rebuttal of his racist argument that people of different racial backgrounds cannot live together in harmony. In fact, the history of the British working-class shows time and again that our unity is our strength. Look at the examples of the battle of Cable Street, Wood Green. Look at London’s West Indian Carnival. It was founded by Claudia Jones—a communist. You won’t hear that on the BBC. Today, as always, the main beneficiaries of racism are the people who run our society. Low wages are only possible where working people are divided. The growth of racism and fascism in Germany and Italy was only possible because of the failure to develop a united front, a failure to bring together people of different political views to fight a common enemy. In the 1970s and ‘80s in Britain we faced the National Front. A united political approach, linked to the flair of Rock Against Racism, led to the launch of the Anti-Nazi League, involving people of different political beliefs, but united against fascism. The success of the ANL and RAR was based on a political strategy that emphasised mass mobilisations through united work spanning different political traditions. There were confrontations, which were necessary to demoralise the fascists and to scare off the softer supporters from the fascist core. The NF was followed by the British National Party. In 1993 Derek Beackon became the first elected BNP councillor in Tower Hamlets. In the 1990s, in the area around the BNP headquarters in London, there were five racist murders, including that of Stephen Lawrence. The BNP went on to win dozens of council seats. Again it was unity that finally defeated the BNP—united campaigns, people united on the streets. Unite Against Fascism (UAF) was instrumental in that. Last week the last BNP councillor announced that he would not be standing for re-election. This week we have had the scandal of the treatment of people who travelled to Britain from the West Indies in response to invitations from the British government when Britain desperately needed workers. The first arrived on the Empire Windrush in 1948. Many more followed, some in the 1960s at the invitation of Enoch Powell who was Minister of Health — the National Health Service needed staff. My uncle worked as a bus driver for London Transport. My mother was a nurse working in the NHS. My father came to work in the nationalised British gas industry. The current racist treatment of the Windrush generation follows the attempts to attack eastern European migrants and blame them for economic and social problems—racism has always been a handy tool to divide people. The seven trillion dollars lost in the 2008 financial crisis caused huge economic and social problems and the working-class is still being made to pay for the crisis. Someone had to be blamed—not the bankers who caused the crisis. The ugly politics of divide and rule became even more evident. The Tories continue with austerity, racism and Islamophobia. The more desperate they are, the more likely it is they will roll out more foul policies designed to shatter workers’ unity and resistance. The Tory government has consistently tried to blame migrants as “draining the NHS,” whereas migrants have in fact been the backbone maintaining the service. The far-right remains, for the moment, fragmented. Ukip has nosedived electorally and will be wiped out in local elections on May 3, but the London march by the FLA demonstrated the potential for a large Islamophobic street movement. Nazi Tommy Robinson was treated like a celebrity by some marchers who took selfies with him. And the FLA message also hardened up on the march. The most right-wing speeches got the loudest applause. Since then there have been racist attacks on Abbott on FLA internet sites. The FLA quickly split, with the founding of the breakaway Democratic FLA, which is associating itself with Ukip. Leading Ukip figures are regularly appearing at DFLA events. The two groups staged separate marches in Birmingham, turning out 2,000 demonstrators—more people than there were counter demonstrators. They are planning to march in London and Manchester next month as they attempt to regroup the forces of the far-right in Britain. It is vital that anti-racists turn out to oppose them. The DFLA and Veterans Against Terrorism plan to gather at Speakers’ Corner in London on Sunday May 6. The FLA intends to march in Manchester on Saturday May 19. The openly racist right is in flux, but groups have been teaming up to target towns such as Rotherham and Rochdale where police and the authorities have failed victims of child sexual exploitation. They want to promote the racist idea that sexism and child abuse is specific to Muslim men. Around 80 people joined their latest event in Rochdale in Greater Manchester last Thursday. Many politicians, including this government, are nurturing the far-right by pandering to their argument that immigration is a source of problems, not of benefits to society. We need a specific broad united front against fascism. We also need a wider formation that confronts racism against refugees, Muslims and migrants and also takes action against state racism and killings by the police. This is why Stand Up To Racism is so important and why it has to take on the racism of mainstream politicians and media. There has been a long and honourable tradition of socialists, trade unions and the left together with black-and-white groups opposing racism, anti-semitism and Islamophobia. There is no room for complacency. These forces are reorganising and gathering again to attack our society. Weyman Bennett is co-convener of Stand Up To Racism. He has been active in anti-racist and anti-fascist campaigning for 30 years.